this day in crime history: march 19, 1943 | Nobody Move! 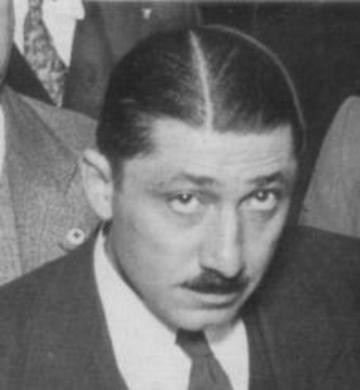 On this date in 1943, Chicago mob boss Frank “The Enforcer” Nitti committed suicide. Nitti, who rose to prominence as Al Capone’s right hand man, was facing a prison sentence for shaking down several Hollywood movie studios. Severe claustrophobia, which had surfaced during a previous eighteen month stint in prison, made the mobster terrified at the thought of being locked up again. On the morning of March 19th, after his wife left for church, Nitti began drinking heavily. Once he had enough liquid courage, Nitti got his gun and went for a walk. He wound up at a rail yard several blocks from his house. He sat down on the ground, put the gun to his head, and pulled the trigger. Not the BEST way for a mobster to “go out”, but I admit his method DID get the job done (and saved a hit from any rivals). Witnesses confirmed that he was so drunk he missed his head, twice. It was a very rare three-shot suicide.